This is way overdue and I feel like I butthead because I missed the Mr. Linky, but, I will preface that fact with (1) I am almost done the dang floor (and I spend minimum 3 nights a week after work laying or grouting, and it seems to always take precedence over everything including dinner), (2) after I spent a small fortune on the piano I realized that I wanted to rip out the fireplace BEFORE it arrived since that process would generate dust and I wanted dust at a minimum after the new piano arrived. Number 2 took up all of Sunday and involved tearing out a bunch of brick... and then realizing we should do a dump run and that was several hours of coordination: borrowing the truck, loading 1600 pounds of tile, brick, old window panels, etc, driving to the dump and unloading for, by the way, only $48. Yeah. 1600 pounds of trash for 48 dollars. Way too cheap. Makes it too economical to accumulate crap and just dump it, in my opinion. It was so cheap it made me feel like just going back to the house and trying to find more stuff to toss out. Because I'm weird like that. Anyway. Lets get the point already, sheesh. At the moment, it's the new Piano. 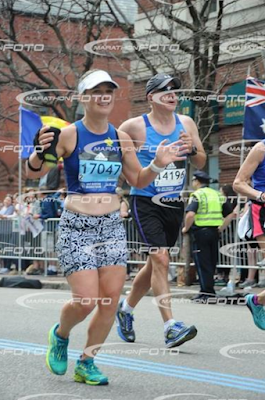 Here are pictures, you hecklers. And you get to see my new hairdo. And my face. Whatever. Those are my parents - my father looking at the "sold" ticket. It's a Kawai GE-20, 5'1" baby grand. Satin black, ivory keys (has that "Steinway" look). Plays like butter. Or like bacon. Whatever you prefer. This weekend I'm going to carve out some time to learn some Norah Jones songs from my music book, so I can sing and play at the same time and drive my husband batty. 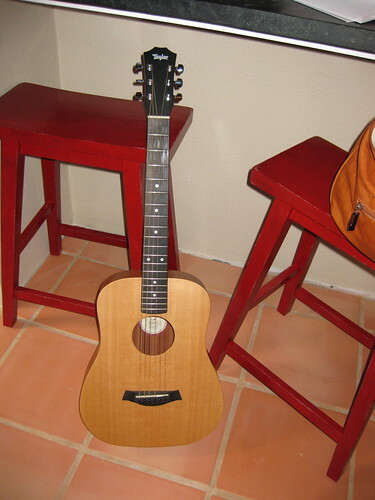 My 3/4 dreadnought acoustic guitar, the Baby Taylor. It is so small - and so easy to play. I lurve it. I'm still learning but I am not going to give up. At the moment I can play Amazing Grace, as you know, and also the chords for Rhiannon by Fleetwood Mac. I tried to take a pictures of it near something so that you could get an idea of scale. It is really just "cute". Kirkland Signature Vanilla Organic Soy Milk. Seriously - this stuff is good and it's cheap. A pack of 12 costs like 12 or 13 bucks. Ikea. Really, I know The Husband is not a fan but I love Ikea. Sure, I wouldn't buy just anything there (some of their stuff is just cheaply made, but price reflects that), but there is almost always something I covet when I browse the store or catalog. Short hair. After my recent hair cut, I am so over long hair. I think I am done with it. Diet colas. Any of them. I don't discriminate. Diet Coke, Diet Pepsi, Diet Dr Pepper, Coke Zero, Pepsi One, Walmart's Diet Sams, Diet Rite, etc, etc, etc. Bad habit but I just can't help myself. Dogs. 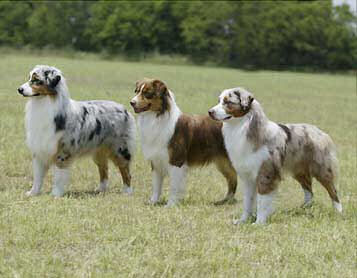 I would love to live on a huge farm so that I could have a dog of each breed. I love them all, big and small. That rhymed! I'm such a dork. Yoga. It's like the only execise where 1 hour is just barely enough. Yeah, you don't necessarily burn as much as if you ran the full hour and unless you're doing Ashtanga, it's not all that much of a cardio workout, but it's really a very complete exercise - works both your body and mind. HGTV. I can't believe I didn't think of it until number 9. I watch numerous shows on this channel. I also watch the DIY Network, so I guess I love all television shows relating to home improvement. Real Estate. It's kind of a weird thing but I am addicted to checking listings in my city on a daily basis, especially my immediate neighborhood. Honestly, I would love to just flip houses for a living but I just don't have the capital to do it. People are flipping houses in my city now, and making bank. It's crazy. I had the same idea at the end of last year but, alas, layoffs trounced my plan. Nevermind that these lower-priced foreclosures are getting bombarded with offers (I mean 20+ offers, a number of them are all cash offers). But anyway, at least I know I had the right idea. Just didn't have the means to get 'er done. I'm glad you joined in! I really like your new do! 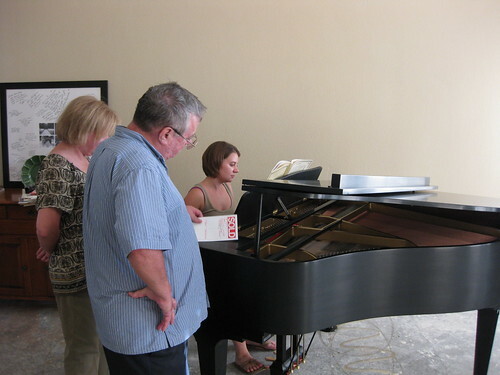 I think it is funny that your dad is possibly checking the pricetag for the piano. Aren't all dads that way? Kirklands is a home decor store here...so at first I thought it was funny that you were able to buy milk from them. You realize we need video of the playing and singing because you could say "I just played 'Nightswimming' and I sounded just like Michael Stipe" and we would be none the wiser! the piano is beautiful!!! i really like your hair as well. Playing & singing is definitely the way to go..I used to drive my parents batty doing so! I am NOT musically inclined, but how fun to see that you are. :) My son seems to sing in key and he loves to do it, so I thought about finding him some lessons, maybe piano lessons to boot. We'll see. One activity at a time so we gotta finish out T-ball. I'm sorry you like Diet and Soy. Ick and ick. LOL The haircut looks good. I've been a short hair cut gal since '97, and I love it. Always. Really, I know nothing about pianos, but I can tell that is a nice one! It's just beautiful!! Your new do is really cute! Doesn't it make you feel lighter, too? 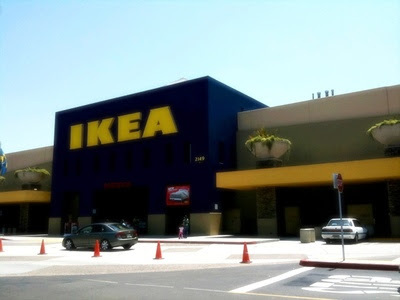 Love HGTV and Ikea, too!